Cannot go without mentioning several more concert options for the week, which is already perking up to look "exciting" and "grand." 1. Squirrel Nut Zippers! tonight at the El Rey. 2. Eilen Jewell tonight at the Mint. 3. The Morning Benders...twice. 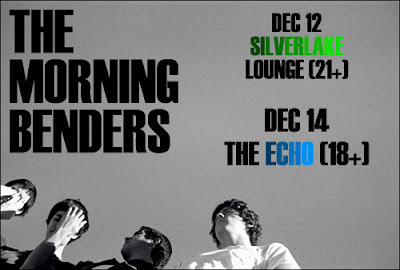 Tomorrow at the Silverlake Lounge and Friday at the Echo. The others simply don't do flyers, but if you're curious about this third act, the Morning Benders are a folky pop group out o' the bay, quite similar to the Shins (thanks mostly to frontman Chris Chu's vocal pitch), and they haven't yet got an album out, as that's due in early 2008. They're darling as indie pop can be, and will be performing with local kids Let's Go Sailing on their Friday date. Oh! And they're offering a friggin' bargain of an EP package on their MySpace page. Go get 'er.